I'm Glad I finally made this.I don't now why, but for some reasons I never made granola till yesterday.Though I always keep roasted almond/walnuts and dry fruits on the breakfast table but not everything combined as one thing, called granola. Yesterday, while baking pasta for the dinner I thought why not make granola also, oven is on, so why not use it for something extra at the same time.But I didn't had dried berries(we are not big fan of dried berries....fresh are always welcome) a common feature in granola, so instead, I decided to use all the dry fruits(love them) I had in my cooler box(yes...i mean fridge).Granola is a very versatile recipe you can easily accommodate any kind of nuts & dry fruits according to your taste. 1) Preheat the oven to 325 degree F. Either grease the baking sheet or line it with parchment paper. 2)In a large bowl mix together rolled oats, salt & cinnamon. 3)In another bowl mix the ingredients for sugar syrup.Microwave it for 10-12 seconds, it helps in mixing sugar & honey, stir it with fork or whisk. 4)Now pour the sugar syrup over the oat mix & gently mix everything using your hands(make sure syrup is not hot), so that oats get coating of the syrup.Spread it on the baking sheet. 5)Bake it for around 10 minutes then take it out, add chopped nuts and cheerios(if using) to it and mix them using spoon/fork(it'll be hot now). 6)Bake for another 15 minutes, take it out, add chopped dry fruits, mix everything together & let it cool. 7)Once it's cool you can store it in air tight container.Or may be just start eating it, like I did. Everybody knows granola comes under the healthy food category,to make it more healthy you can also add wheat germ to it once it's baked. 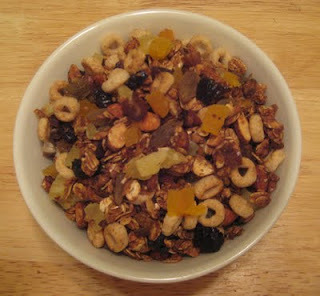 And I guess by now you must have figured out why I call it Fruity Granola and not simply Granola,I used more nuts & dry fruit then Oats, and to explain the benefits of all these dry fruits I believe I have to write another post soon. 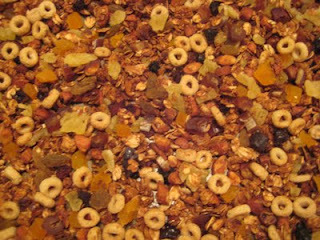 very healthy nutty fruity granola..i should give it a try..have 4lb almond bag in pantry.. Thanks Usha, & SE go ahead & try it it's not only easy but healthy too & do give me the feedback. hey..I have awards for you at my blog..do pick them up..
hey, hope you had a good Diwali. Belated belated Diwali wishes though. Ah, good idea of making granola at home. I like the idea of adding cereal to it.